An interactive underwater spectacle immerses the senses into a digital adventure. The fish are dancing in Silicon Valley: Majestic reef sharks, agile Garibaldis and shiny silver sardine swarms populate the lobby of the Intel headquarters. They gently glide through a light-flooded algae forest with atmospheric sounds, coming into close contact with their curious audience. Using Intel® RealSense™ technology, “Kelp Forest” expands the sensual experience with the interactive discovery of a digital marine world. Since 2017, Intel Corporation welcomes employees and visitors to its Santa Clara headquarters with a new screen system consisting of a Brand Story Wall at the entrance and a Digital Skylight that extends like a dome over the adjoining lounge area. 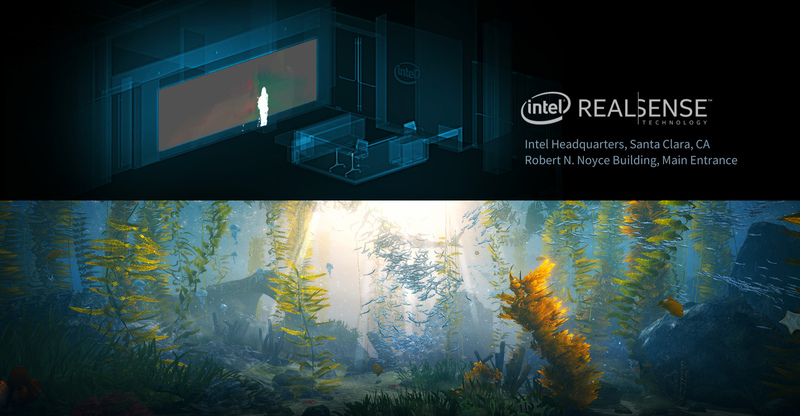 In cooperation with Intel’s art direction department, we designed “Kelp Forest” for both components as an epitome of the underwater world of the Southern California bays. The generative lighting mood adapts to the natural course of the day. Oceanic sound waves intensify the sensual impression of the seascape. The highlight is the interactive LED wall with six integrated Intel® RealSense™ cameras. They generate depth data for targeted control of the fish. Whenever there’s movement in the room, the autopilot is replaced by an interaction algorithm. Visitors waiting in front of the screen let the sardines swarm in, while hectic gestures will drive them away in an instant. Under the skylight dome, the interplay between the real and digital world is complemented by the impression of a deep connection with the audiovisual scenery. The reconstruction of the lobby, including the implementation of the screen system, continued throughout the entire development period of the project. In order to provide our customer with a detailed preview of the current status, we developed a VR simulation of our designs inserted into the planned room architecture. 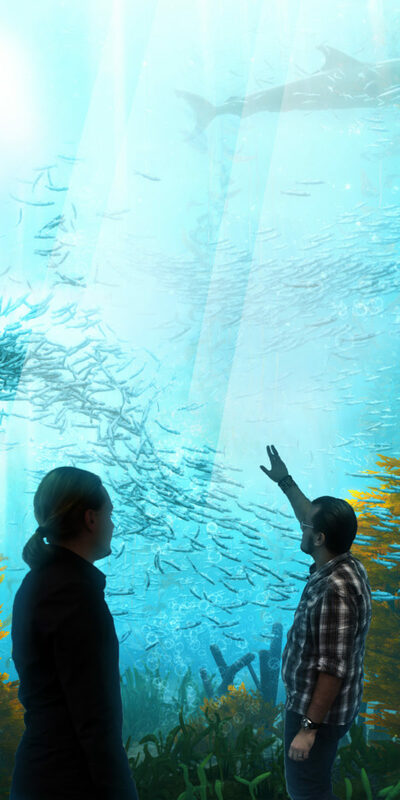 As the first interactive application for the system, the “Kelp Forest” is still an integral part of the new Intel lobby’s daily program. Thanks to Dell’s great support in Halle, we were able to test and develop the real-time application on our premises using a high-performance PC system.